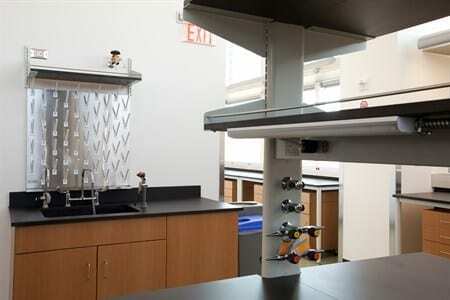 As technology advances and equipment catches up, laboratory environments are bound to be demanding workspaces. 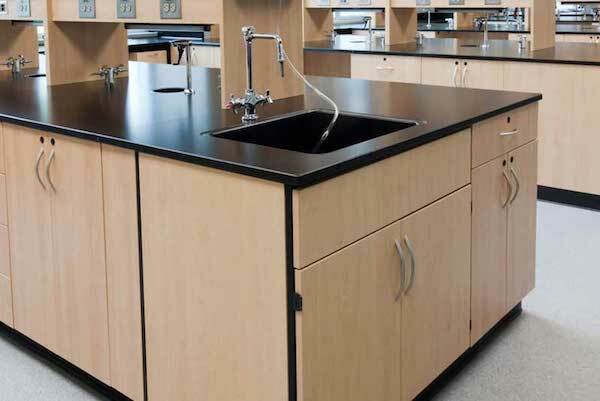 Designing a flexible lab is key to remaining responsive to the updates and modifications that may come up, with minimal effort. As with many industries, storage space is an important and valuable consideration. These can be addressed using a number of different combinations of systems, whether your lab is a flexible open-bench environment, a traditional space or a hybrid – the requirements remain the same. Our team of experienced and industry-educated lab planners will work with you to understand your needs and help you develop the a solution to keep your lab moving, despite changing variables. The Pediatric Heart Center at Tulane Hospital for Children debuted the first and only combined Hybrid Cath Lab / Operating Room Suite in Louisiana. 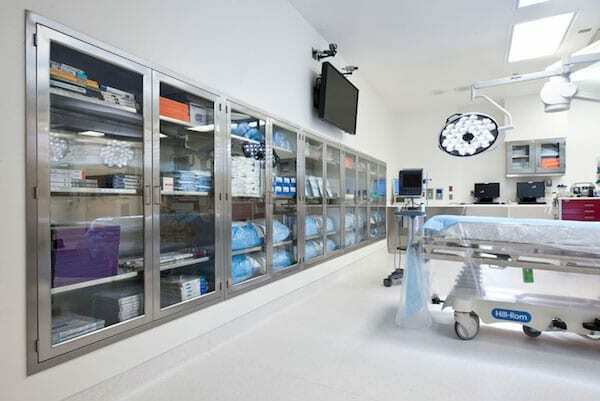 One of just ten hybrid cath labs in the country, Tulane’s lab is a fully equipped pediatric catheterization lab as well as a full operating room. Here cardiologists and surgeons work side-by-side to open the chest, place delivery catheters in the heart, and deploy devices. Chemical storage can be hazardous. They must be kept secure to prevent unauthorized access and need to be stored in a well-ventilated location to prevent the accumulation of fumes. 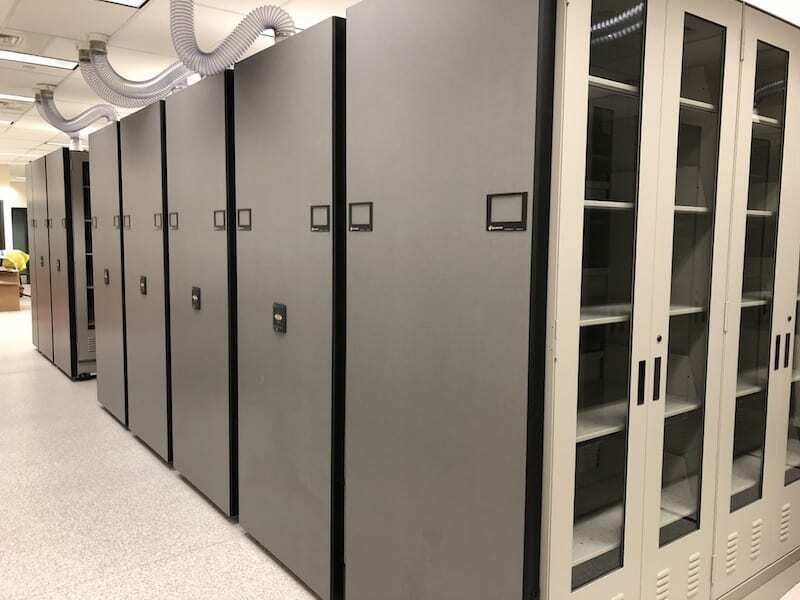 We designed a new storage solution that increases storage capacity, promotes ventilation and security, and allows them to see items in storage. 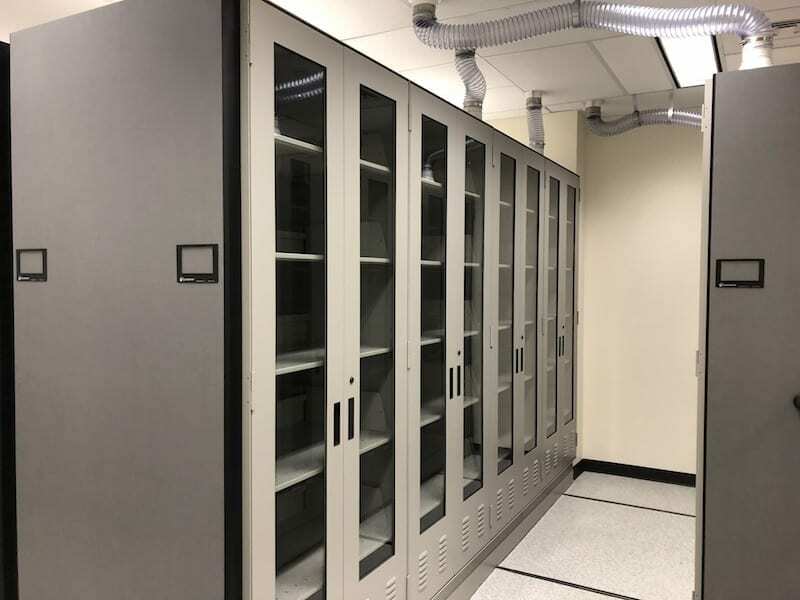 With high-density storage fitted with four-post shelving, we doubled the room’s storage capacity and improved visibility, safety, and ventilation. Shelving units were fitted with frame doors that had glass panels for visibility, keyed locks for security, and louvers for ventilation. 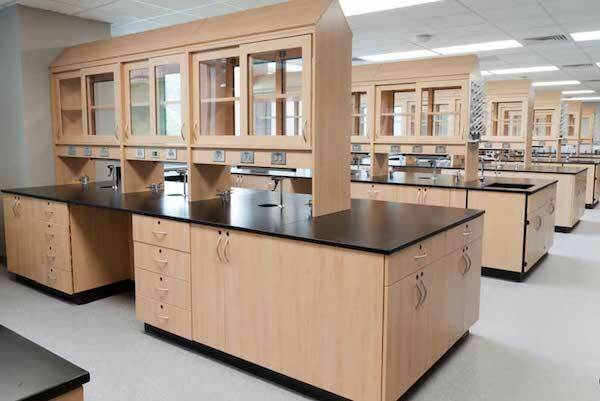 From lab furniture to fume hoods, we have what you need to streamline your facility – with the expertise you’re looking for to match! 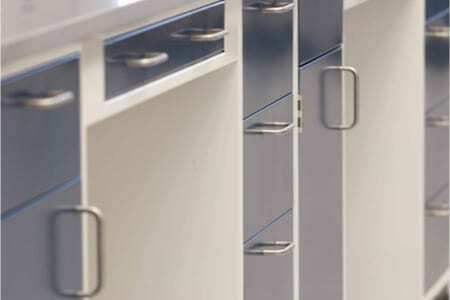 Steel & Wood Casework: Base, wall, upper and tall cases in the sizes and styles you need to complete your laboratory and storage room project. 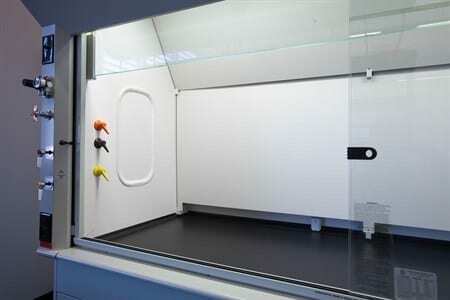 Wardrobes and cases for glass tubing, microscopes and tote trays are also available. 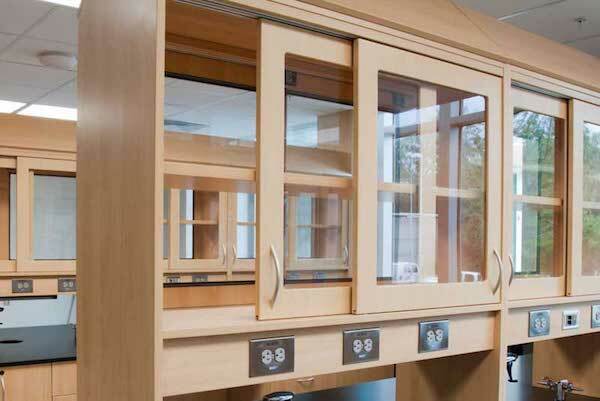 Fume Hoods: Fume hoods that are designed to address safety, energy-efficiency and aesthetic requirements— standard, custom, or hoods for a specialized purpose. 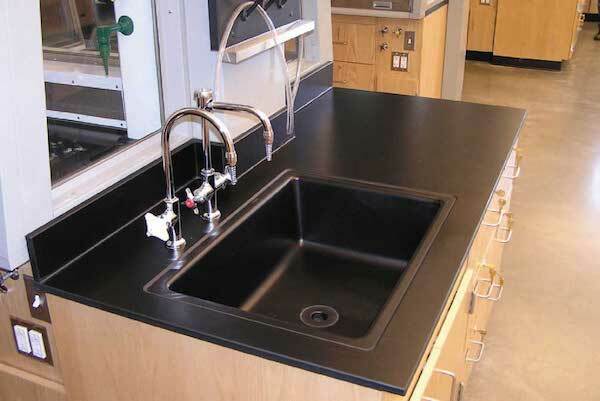 Lab Sinks, Fixtures & Safety: Hamilton has a wide selection of fume hood tops, fixtures & accessories, including fume hood alarms, safety stations, electrical fixtures, pegboards & more! 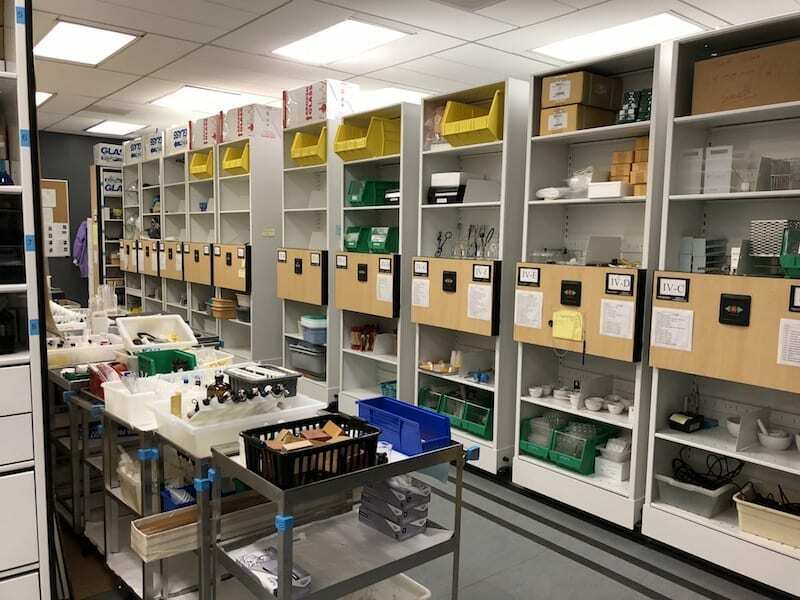 Our storage consultants can help make sure your laboratory is optimized for your internal processes and able to contain all necessary materials. 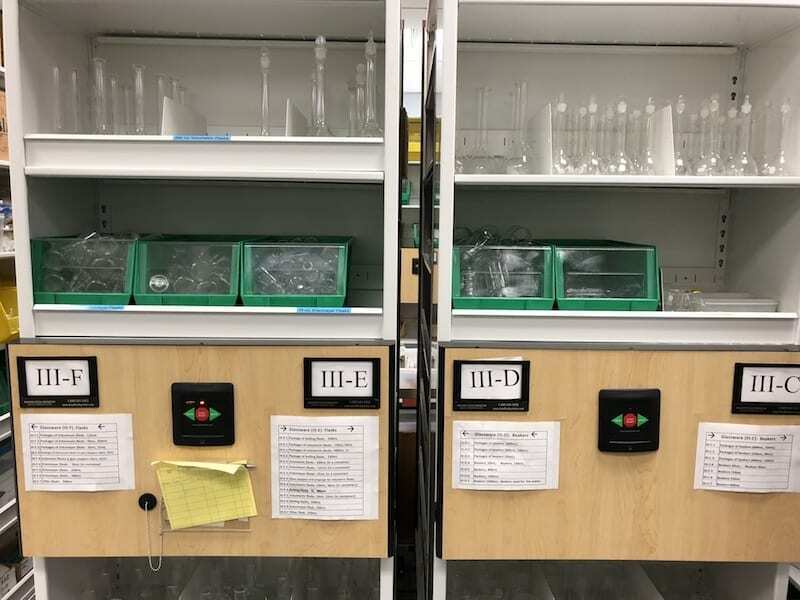 Lab storage is challenging because there needs to be space for students to work, but also a safe way to store hazardous chemicals and fragile glassware. Our team used the 80/20 Rule to create a system where the most commonly used items were the most easily accessible. The high-density system was equipped with Zero Force Sensor® to protect students while the mobile shelving is in operation. Additionally, a soft start/stop was used to protect fragile glassware during movement.